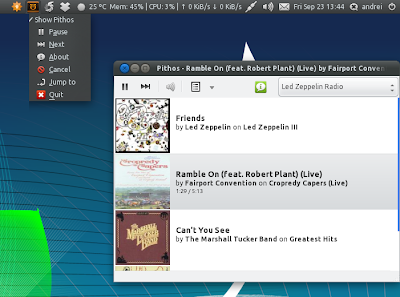 Pithos is a Pandora.com client for Linux that comes with Last.fm scrobbling support, allows you to use a proxy or create QuickMixes, displays cover art, has NotifyOSD, multimedia keys and Ubuntu AppIndicator support and more. A quick update for those of you that are using Pithos from the official Ubuntu repositories: a new Pithos version (0.3.11) has been uploaded to its PPA which supports the latest Pandora protocol so if you want to continue using Pithos, use the PPA to upgrade. The new Pithos version also adds an option for changing the audio format / quality (aacplus, mp3 or mp3-hifi).